Felt like knitting some over-knee socks, toe-up, and Novita Tico Tico (75% wool, 25% nylon, 2.5 mm needles) seemed like a nice yarn to knit them of. I started off with purple ones in January 2011 (Ravelry link). Knitting, as usual, was fun, but having to try them on to figure out the perfect shape made the process a bit slow. What really slowed me down was knitting the second sock with all increases. I had written notes in Ravelry, though, but by the time I got to the calf increases, I had forgotten all the increase patterns and had to check my notes all the time. For the second pair of over-knee socks (Ravelry link) I also needed a second ball of yarn, but that was from a different dye lot. Therefore I didn’t try to match the stripes, I just casted on from the beginning of the yarn. 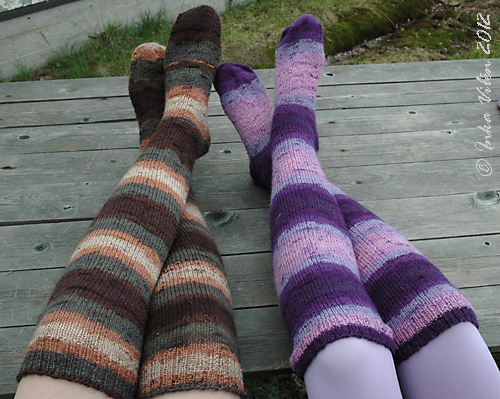 When I was a kid, I knitted myself a pair of knee socks with cables on the side. Found some sock yarn (Novita Tuomas, 40% wool, 35% nylon, 25% polyamid) in the local shop and decided to knit socks as high as they’d come. This simple cabletwist on both sides wasn’t the best choise of patterns, but it gave me something to keep myself on the track while knitting (Ravelry link). The yarn was rather harsh on my hands, but I assume the yarn was made for heavy-use socks. Well, come to think of it, my use at home seems to be heavy-use, concidering the number of socks that I have worn out just by using them at home indoors. 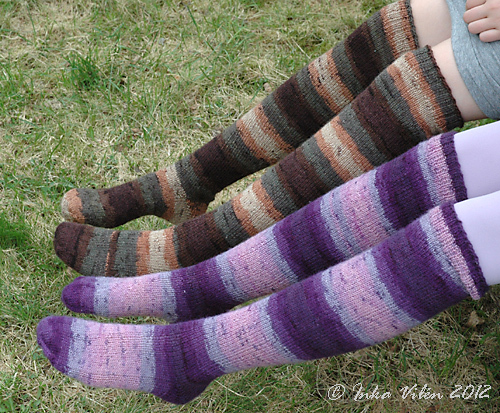 This sums up my knee sock projects of 2011 (pair 1) and the first half of 2012 (pairs 2 & 3). Come to think of it, these might cover the second half of 2012, too. 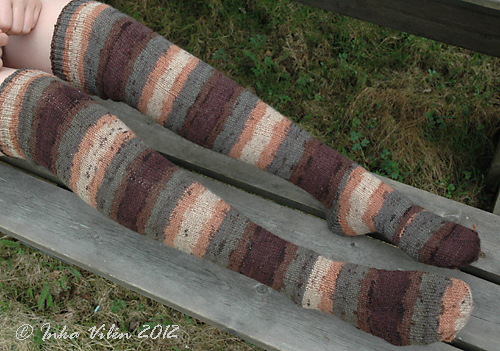 This entry was posted in finished, yarn work and tagged knitting, socks, toe-up by Inka. Bookmark the permalink.